EDIT: Giveaway is officially over. Congratulations to Francesca Romana Mazzuca for submitting the randomly chosen 387th entry! 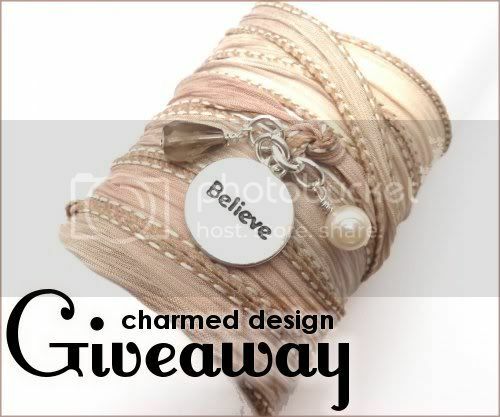 Believe it - Lori of Charmed Design is letting one lucky winner pick a piece out of the hand dyed silk wrap bracelet category of her jewelry store. The silk ribbons are hand painted to create that stunning gradation of color. Each wrap around bracelet is embellished with a mixture of charms and gemstones that enhance positive energies, such as luck or peace. To wear one, just wrap the ribbon around your wrist, tie and tuck in the ends. The ribbons are over 30 inches long so they can also be transformed into anklets or necklaces. Making jewelry began as a constructive and uplifting hobby to do while Lori was recovering from a sudden and life threatening illness. Although she lost her job, home, and life as she knew it, surviving such a near death experience has made her believe that she is indeed charmed, hence the name of her business. Her modern and meaningful designs reflect her experience and love for life. She is such an inspiring woman! I am glad she persevered to celebrate another birthday today, February 19th, and share her beautiful work with us. Use the Rafflecopter below to enter to win Lori's jewelry giveaway before 11:59pm EST on March 5, 2012. I love the "Screen Actors Guild Awards" bracelet. That purple is my favorite shade! I love the Tree of Life Silk Bracelet with Peace Sign and Amethyst the best!! I love the Purple Braided Leather Bracelet with Lotus Flower! Wow, these bracelets are amazing! I love the Tree of Life Silk Ribbon Bracelet with Peace Sign and Turquoise. I really like the 'tree of life charm wrap bracelet' made from Japanese chirimen cord. Very pretty and just the colour I like too. You know how much I love her work! It is so hard to pick a favorite. I like just about all of her green and blue pieces. I like the Tree of Life Silk Bracelet with Peace Sign and Amethyst. The Silk Ribbon Wrap Bracelet with Words is beautiful. I love the colors. Thanks to both of you for this lovely giveaway!! My favourite item is the Silk Ribbon Bracelet with Hamsa, Peace Sign, and Turquoise. it is so nice and beautiful! I love the Orange Braided Leather Wrap Bracelet with Lotus Flower Charm and Turquoise, wrist wrap! my favourite item is the Knotted Bracelet with Flower Charms. Wow these bracelets are beautiful and so unique! My favorite piece is the pink leather wrap bracelet with the lotus charm, so pretty! I like the Silk Ribbon Wrap Bracelet with Lucky Elephant since I love elephants! My favorite is the Silk Bracelet with Gold Om Yoga Symbol. Oh ... my Godness, your stuff are really creative and tastefull. I love the tree of life charm! I love the Tree of Life Peace Sign and turquoise wrap! I like Knitted Bracelet with Flower Charm. I had never heard of these before-but they are STUNNING! Love them! My favorite item is the Tree of Life Silk Bracelet with Peace Sign and Amethyst. Love the Japanese Chirimen Lotus Blossom Bracelet!!! I love the Pink Braided Leather Wrap Bracelet with Charms for Protection! I love the Silk Ribbon Bracelet with Circle Infinity Connector. It features a ribbon w/ purple, plum, blue, and brown hues. Very pretty! i like the silk ribbon wrap with the tree of life! Wow! They have some great things! I love their Silk Wrap Bracelet with Gold Hand of Fatima. believe! we all should!! gorgeous! This is my favorite, although it's so hard to choose! My fav item is Tree of Life Silk Ribbon Bracelet with Peace Sign and Turquoise. Christina - xristya@rock.com - Hand-wrapped silk bracelet with Omsa and Turquoise! I went with the one with colours that spoke to me - the one with protection charms. I do believe I need protection. I love the Knotted Bracelet with Flower Charms. my favorite item... oh gosh that is a hard one. I will have to go with. I love all of them, seriously! Wow. This is just so lovely! Cool!! My favorite is the silk wrap bracelet with om symbol, peace sign and jade. Beautiful colors! SO gorgeous! I love the Screen Actors Guild Awards Gift Bag Silk Wrap Bracelet with Om and Peace Sign Charms. I love the wrap charm bracelet with leaves. xo Thank you for linking this to the Thursday Favorite Things hop. I love the Japanese lotus flower one. tree of life symbol bracelet. I love the Wrap Bracelet made with Japanese Chirimen Cord and Tree of Life Charm the best. My favorite is this one: http://charmeddesign1012.indiemade.com/product/silk-ribbon-bracelet-lotus-flower-and-amazonite-briolette I love the lotus flower and the colors. I love the Hamsa Charm Connector Silk Wrap Bracelet. It's a close call, but I love this bracelet the best: Silk Ribbon Bracelet with Peace Sign Charm and Buddha Head, followed by the Silk Ribbon Bracelet with Om Charms and Amazonite, and Hand Dyed Silk Ribbon Bracelet with Silver Yoga Om Symbol, Peace Sign and Amethyst - Super cute! My favorite is the Tree of Life Silk Bracelet with Peace Sign and Amethyst. I love the Hand Dyed Silk Wrap Bracelet with Greek Key Design. Thanks! Gorgeous giveaway!!! Love silk ribbon bracelet! Love the colors with Silk Ribbon Wrap Bracelet with Words. I really love the Silk Ribbon Bracelet with Hamsa, Peace Sign, and Turquoise, yoga jewelry wrist wrap! Such a beautiful colour combo! My favorite item is Jewelry with Words Silk Ribbon Wrap. The colors are so beautiful and word "believe" i just love it! I like Tree of Life Silk Bracelet with Peace Sign and Amethyst. I love the Tree of LIfe Charm and Chain Wrap Bracelet. Thanks for the chance to win! i love the silk wrapped green! thanks! I like the Greek Key design silk wrap bracelet. My daughter would absolutely LOVE the Silk Wrap Bracelet with Om Symbol, Peace Sign, and Jade!! my favourite item off of the website is the Braided Leather Wrapped Bracelet with Gold Hand of Fatima. I love how the description says that it "will create positive energy, happiness, prosperity and good health!" My favourite item is Silk Ribbon Bracelet with Protection Charms! Beautiful! I love Hand Dyed Silk Wrap Bracelet with Greek Key Design! I love the Silk Ribbon Wrap Bracelet with Lucky Elephant! I like the Tree of LIfe Charm and Chain Wrap Bracelet - nice for my daughter. I love "The Tree of Life Silk Wrap Bracelet" in brown. I love them all to be honest with you. I have admired Lori's shop for a very long time. One of my favorites is the wrap charm bracelet with leaves. I've never seen bracelets made of satin and silk; really neat idea.